Who says learning can't be fun? 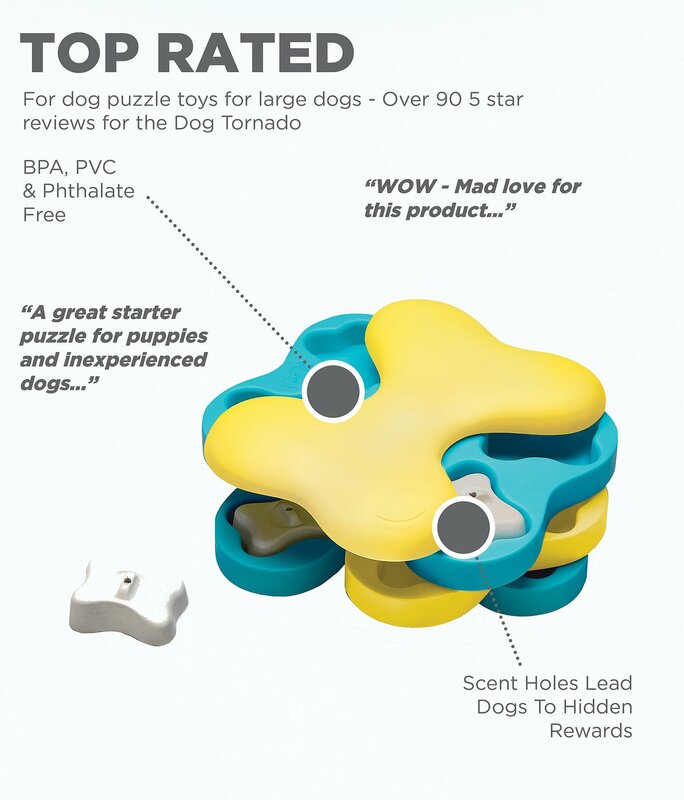 With the Dog Tornado Plastic Interactive Dog Toy, you can stimulate your pup's brain and have a blast at the same time! The unique and interactive toy has four layers of rotating discs. There are compartments where treats can be hidden in three of those layers. Fido has to learn to rotate the different layers in different directions with his nose or paw in order to find the hidden goodies. Increase the degree of difficulty by placing the white plastic blocks in some of the compartments. He'll love the reward of a job well done, and you'll love watching him put on his doggy thinking cap! 4 layers of rotating discs provide mental stimulation to keep your pet happy and healthy. Difficulty level 2 makes this game challenging for your pup, so he may not get it on the first try. 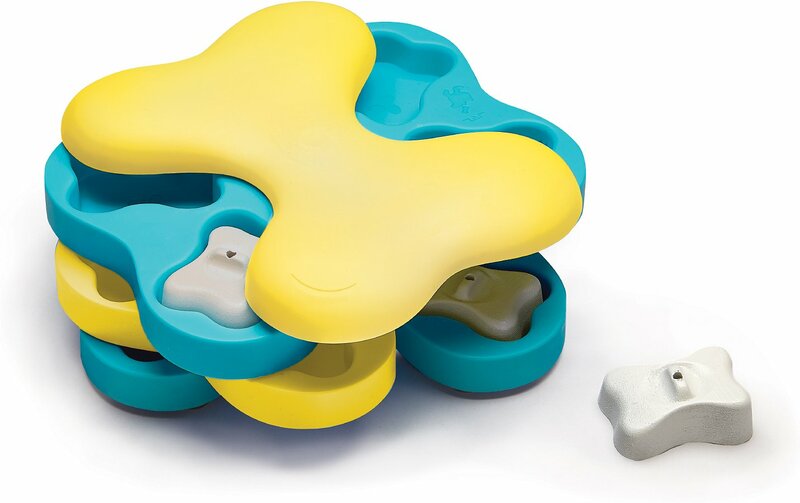 Hide treats or kibble in different sections of the puzzle or under the bone blocks to further increase difficulty. Enhances your relationship with your dog by rewarding him with the treats or kibble he loves. Suitable for dogs of any age or size, so you can have a blast with any pup. HOW TO PLAY: Place treats or kibble in compartments of the base. Cover some compartments with bones. The more covered compartments, the harder the game will be! Let the games begin! 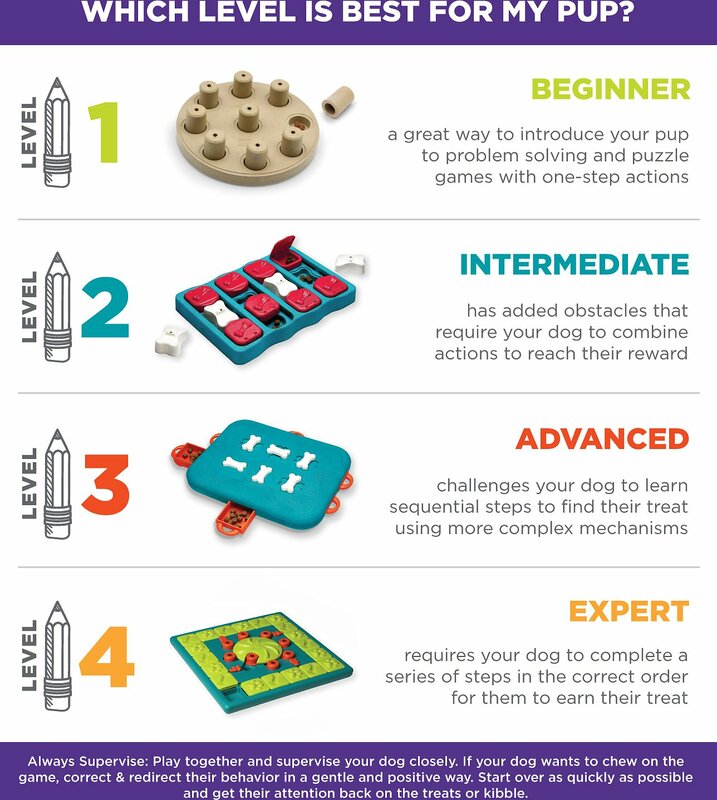 Show your dog how the game works and encourage them to find treats. Dogs are smarter than you think. Sometimes we just need to teach them! Leave some compartments uncovered and show your dog how it spins. FROZEN PUZZLE: Mix some canned/wet dog food or raw food with water, pour some of the mixtures in the hollows, or place a small piece of sausage or a tasty treat in each of the hollows, pour a little water, put the game in the freezer and let it set. Perfect for energetic dogs, hot weather, or just extended fun. EASY TO CLEAN: To wash your dog’s Dog Tornado, simply remove all treats/kibble and hand wash with warm soapy water, rinse clean and dry. Fill again for more fun! This product was decent for my pups and we still use it. Took my 7 month old German Shepherd about 1 minute to figure out how it worked (without the white blocks) and maybe 5 to eat all the treats. With the white blocks it was more challenging although I agree with other reviewers that it needs strings to attach to the bones to make them easier to remove. My main issue with this you is it is incredibly light weight and my dog knocks it all around. Maybe if it had a weighted base it would work better. I have an older dog who incessantly barks for treats in the evening. I purchased this item to see if it slowed him down a bit. For a 15-year-old dog with neck issues which affect his mobility, he still got through it pretty quick. He is small but he figured out he can pick it up and drop it upside down and all of the treats fall out. It would be nice if the white pieces came with a string in them, that is the one part that he can't manage to get out with his paw or his teeth. I added a string myself and it works. Not a bad toy, I think my dog is more of a level 3 hound. Thank goodness for this puzzle toy. I have an Australian Cattle Dog and German Shepherd/Husky; both puppies ages 8 and 7 months old. When they get bored (mainly my Cattle Dog) they get destructive. It gives them the mental stimulation they need and us the time to relax and unwind after a long day at work or just time to get the necessary chores around the house completed. This was one of the highest rated dog puzzles on Chewy so we were excited to get it for our new rescue pup to help build her confidence and keep her occupied using her brain...well...she figured this out in under a minute. Similar to the other reviewers, the spinners spin SUPER easily! and it's not that hard to pickup the bone / paw it out. Wish there was more sequencing to this. We have a 1.5 yr old GSD. She needs to 'work'and sometimes it can't be outside. This is another game in our arsenal to make her mind work, stave of boredom and to teach her persistence in working through the problem. We've been disappointed in other toys of this nature. This is a winner. Our whemmie concerned this in a matter of seconds (second toy for interactive play) We really liked that the toy came with suggestions on how to make their toy increase in levels of challenge for your pet. Our trainer recommended puzzles for our Lakeland Terrier to keep her mind occupied. After a few times she gets through the original puzzles we bought too quickly. Because this one is on several levels, it’s much more difficult and keeps her occupied and challenged. Glad that we got it. May be good for puppies but not big dogs. Spins super easy so it was easy for dogs to get treats out. Or, if they pick it up, everything falls out and they can gobble down the treats. Took dogs less than 1 minute to get the treats out. I bought this for my daughter's 7 month old puppy when she adopted him from the pound two years ago. It's very durable and was a challenge at first, but her dog is SUPER SMART and figured it out pretty quickly. We'll probably donate it to someone else since it's still in such good condition. My Australian Shepherd and Mini Golden are entertained and challenged. Customizable difficulty levels with adding the bones. Highly recommend if you have a pup that needs a challenge not to be bored.